Beyaz is a combination birth control pill that, when taken every day, can help prevent pregnancy. Each Beyaz pill also provides a daily folate dose. Folate lowers the risk of having rare neural tube defects in a pregnancy. Beyaz birth control can also help treat premenstrual dysphoric disorder (PMDD) as well as moderate acne. 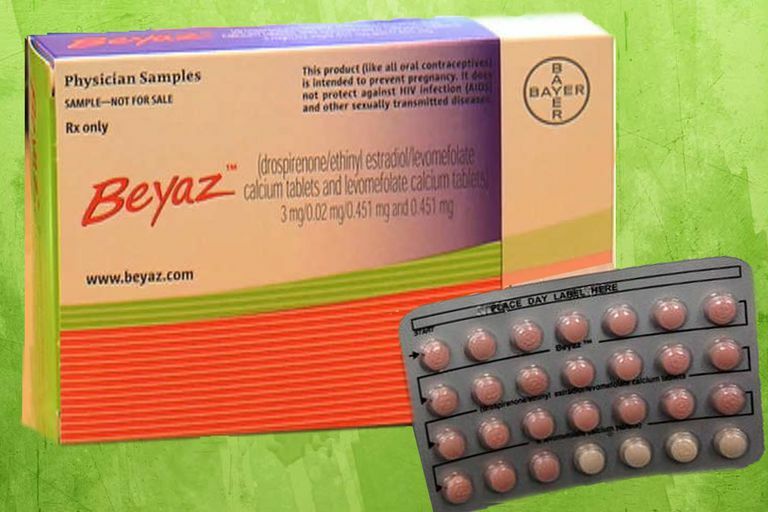 Each pack of Beyaz birth control contains 28 pills — 24 pink tablets, each containing 3 mg drospirenone (a progestin), 0.02 mg ethinyl estradiol (a synthetic estrogen), and 0.451 mg levomefolate calcium (a B vitamin). There are also four light orange tablets — they do not contain any hormones but do have 0.451 mg levomefolate calcium. Because there are only four placebo pills, Beyaz is also considered to be an extended cycle birth control pill. Beyaz works like other birth control pills. Each pack supplies a steady dose of drospirenone and ethinyl estradiol to last for one month (24 hormone pills and 4 reminder pills). Beyaz provides a daily dose of folate supplementation, which is recommended for women in their reproductive years. Folate lowers the risk of having rare neural tube defects in a pregnancy occurring during Beyaz use or shortly after stopping. If you choose to use the Pill as contraception, Beyaz is one kind that provides you with the 0.4 mg (400 mcg) of folic acid recommended daily for women of reproductive age. Beyaz is also FDA-approved to treat moderate acne. It is thought that the drospirenone in Beyaz helps to block the androgens (hormones) that cause acne. If you have chosen the Pill for contraception, have started having menstrual periods, and are least 14 years old, Beyaz may be a good option to help treat your moderate acne. Beyaz is also FDA-approved to treat the emotional and physical symptoms associated with PMDD. Premenstrual dysphoric disorder (PMDD), a severe form of PMS, is a condition that adversely affects the psychological well-being and social interactions of some three to five percent of women of reproductive age. PMDD symptoms occur regularly before menstruation starts and go away within a few days following the start of the period. They are usually severe enough to impact your daily life. For women who choose the Pill for contraception, Beyaz can help offer some relief for PMDD symptoms. Beyaz has not be shown to be an effective treatment for premenstrual syndrome (PMS). Beyaz and Yaz are very similar birth control pills. The greatest difference between them is that Beyaz contains the daily dose of levomefolate calcium (B vitamin/folic acid). This makes Beyaz a birth control pill for those rare times that birth control fails. Why? If you get pregnant while on Beyaz, you will already have the required amount of folate in your body. When women have folate supplementation, it lowers the risk of should lower the chances that your baby will have a neural tube defect. Keep in mind though that if you do get pregnant while on the pill, your pill use will not harm your baby in any way. Drospirenone helps suppress the secretion of the hormones that regulate the body's water and electrolytes. Drospirenone may cause higher potassium levels. Because of this, Beyaz may not be the best pill brand for you if have kidney, liver or adrenal disease because Beyaz could cause serious heart and health problems. This birth control method is usually a safe option for most healthy women. It's important that you discuss your complete medical history with your doctor before using Beyaz. Typically, serious problems do not occur very often with hormonal birth control use. Some women can still use Beyaz even with certain risk factors as long as they remain under close medical supervision. Women with a history of depression may not be able to continue to take Beyaz if their depression worsens. Since this method requires you to take your pill at the same time every day, it may not be the right option if you have trouble remembering to take it. A serious problem that could arise from Beyaz use is blood clots in the heart, lungs, brain, or legs. Women using Beyaz who are confined to bed rest or a cast may have a higher chance of developing a blood clot. The FDA has issued several advisories about blood clots with drospirenone pills and requires special labeling for these products. According to Bayer, "Do not use Beyaz if you smoke cigarettes and are over 35 years old. Smoking increases your risk of serious cardiovascular side effects (heart and blood vessel problems) from birth control pills, including death from heart attack, blood clots or stroke. This risk increases with age and the number of cigarettes you smoke." You will usually need to have a medical evaluation, blood pressure check and possibly a pelvic exam by a doctor to obtain a prescription for Beyaz. You can then have your Beyaz prescription filled at a local pharmacy. Day 1 Start: take the first pill of the pack during the first 24 hours of the start of your period. You will not need to use an over-the-counter birth control backup method of birth control. Sunday Start: take the first pill of the pack on the Sunday after your period starts, even if you're still bleeding. If your period begins on Sunday, start the pack that same day. Use a backup method (like a condom and spermicide) until you have taken 7 pills. Beyaz comes in monthly packs that can cost anywhere between $15 to $80 (plus the expense of having a medical examination or blood pressure check in order to get the prescription). There is currently no Beyaz generic alternative available. In many communities, Medicaid covers the cost for this contraceptive method. You should check with your private health insurance policy as coverage for many combination hormonal contraceptives should be covered with no out-of-pocket costs for all non-grandfathered insurance plans. Bayer is also offering a savings card program for Beyaz. After you sign up for this program, you will pay a $0 co-pay for Beyaz if you are insured. If you do not have insurance, you will receive up to $100 off each Beyaz prescription. Beyaz pills are 92-99.7percent effective. This means that with typical use, only 8 out of every 100 women will become pregnant during the first year of use. With perfect use, less than 1 will become pregnant. Certain medications may also decrease the effectiveness of hormonal contraceptives like Beyaz. This method offers no protection against sexually transmitted infections. Fruzzetti F. Beyaz: An oral contraceptive fortified with folate. Women’s Health. 2012;8(1):13–19.